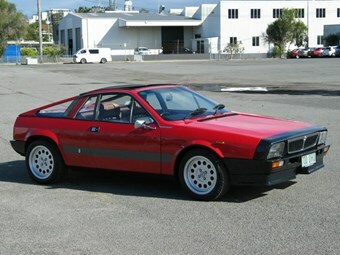 The Lancia MonteCarlo was originally penned by Pininfarina, and intended for Fiat. However, Fiat ended up using a cheaper design by Bertone – with Pininfarina continuing work on what was to be his first wholly designed and developed new car (as opposed to a redesigned existing model). Lancia ended up taking on the project as their halo car, but amidst the 1970s Oil Crisis, downsized the engine to a 2.0lt four-cylinder from Pininfarina’s intended 3.0lt V6. Though the first production series of the MonteCarlo (built from 1975 to 1978) was denoted as the "Lancia Beta MonteCarlo", the Beta name was dropped in the second series of production from 1980 to 1981 as the MonteCarlo actually shared very few components with other Beta cars. The 2.0lt four-cylinder was sourced from the Fiat 124 Sport Coupe, and featured a five-speed manual gearbox, MacPherson strut suspension and disc brakes at all four corners. The car was built in-house by Pininfarina. In total, 7,798 MonteCarlos were produced over its 8 years of production, 4,375 spiders and 3,203 coupes. This early-series Lancia Beta MonteCarlo was originally delivered to the UK in factory right-hand drive and, interestingly, was reportedly imported to Australia in 1982 by Alan Jones’ F1 Mechanic. Thereafter, the car was sold to a Brisbane-based car collector, and was repainted in Ferrari Rosso in 1984. The car has seen sparing use since then. The car comes with larger front brakes, 15" alloy wheels, twin Weber carburettors, Facetti air box Abarth camshafts and exhaust extractor. It’s also recently been given a recondition – in regards to its cooling system, brakes, bushes and carburettor. The seller claims the car to be a genuine 50,000km example, with minimal use over the last 34 years. The car is based in Brisbane and is listed for $45,000. A huge turn-out for an annual favourite. We you there? Gateway Classic Cars’ Las Vegas showroom offering one well-travelled Aussie classic. Japanese Racing Team holds the greatest garage sale ever! Fancy an F40, or just a spare engine or two? Super-GT cars, Group A cars? Take your pick!